Irish Garden House: Happy Day . . . Happy Day . . .
AEF and USNA invites anyone to post photos and videos provided by these high definition cams. to install and stream two high definition video cameras from the top of the nest tree. and was partially funded by the Department of Energy and Environment. and laid her second egg on February 14th early in the morning. and both eggs are expected to hatch about 35 days after being laid. of "Mr President" and "First Lady" and their fledglings. mentioned this and had a link to them in a recent post. OI have been in awe since. mom and dad were no where to be seen and there were those two little ones all alone. So if course I had to watch over them, "mothering" as I am. to let you know, so hopefully you can go watch too. Hello Lynne, I love to watch the eagle cams too. Great capture and info. Thank you for linking up and sharing your post. Happy weekend and Happy Easter to you and your family. 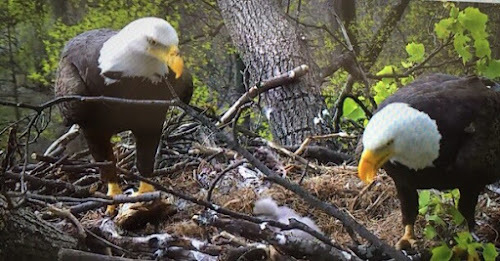 They were talking about eagle-cams on NPR yesterday but I hadn't seen any photos. Thanks so much for sharing this and the info, Lynne! Hope that you and your family are enjoying the Easter holidays Lynne .... lots of chocolate I hope !! So fascinating to watch! Happy Easter to you, too! Happy Easter, Lynne, Jack and Snickers! So glad you three are in my life. It's so nice to find folks that are on the same page. Just good, decent and kind folks! We used to have a bird sanctuary and they had two eagles there that needed rehab. It was so neat to watch them. We would go often. I was always taken with how big they were and how strong and commanding their stature was...it was easy to see why they were chosen as a symbol of our country! oops...I meant we used to have a bird sanctuary nearby. I did not have a bird sanctuary! Can you imagine that? Ha!! Amazing! Thanks for sharing a very moving post. Happy Easter. It's no wonder the Eagle is our National Bird. They truly are majestic !